Velux skylights improve the living conditions of any home or building by providing natural light without using electricity. 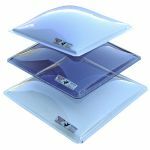 One of the essential parts of skylight installation is the flashing system and it must be designed to ensure that your Velux skylight is completely weathertight to all weather conditions. 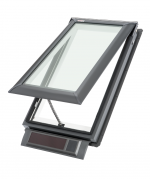 Installing the right flashing is important for both the product durability as well as the performance of Velux products. Flashings must ensure that the products are not only weathertight but also pitched correctly, compatible with the roof type and also match the roof colour for appearances. Here at Skyspan we believe that enhancing the interior does not need to be at the expense of the aesthetics externally. Velux Flat Roof Skylight ranges FCM (Fixed), VCM (Manual Opening) and VCS (Solar Opening) do not come with and Flashings at all. 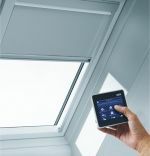 Although Velux Flat Roof Skylight can be used on 0° roof pitch, Velux recommends that are have a slight pitch (e.g. 3° - 5°) to prevent condensation build-up and water ponding on the glass. 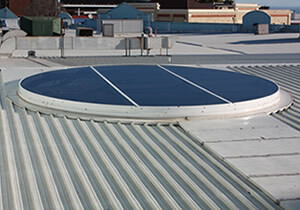 Skyspan Custom Flashings for Velux Flat Roof Skylights are available to suit all Australia roof types. 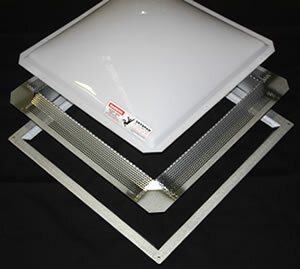 The standard Velux Tile Flashing cannot be used on any Metaldeck Roofs. 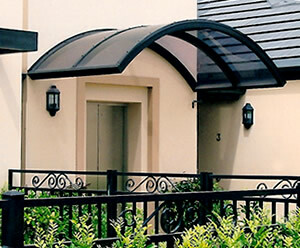 Example Metaldeck Roofs are Klip-lok®, Trimdek®, Spandek®. 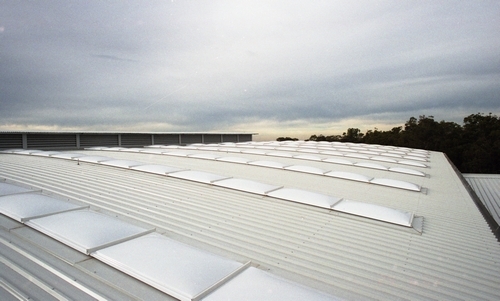 Skyspan Custom Flashings make Velux Products suitable for Metaldeck Roofs. The Standard Velux Tile Flashing is not designed for Corrugated Roofs. The Standard Velux Flashing can be modified to suit Corrugated Roofs however this is not standard Australian Roofing practice and it requires removing the existing Corrugated Roofing Sheets and placing the Velux Tile Flashing onto the roofing structure the re-laying the sheets on top of the flashing and then adapting the tile flashings into the shape of the Corrugations. The Skyspan Custom Flashing for Corrugated Roofs is designed for Corrugated Roofs in accordance with Australian Roofing Practices, this makes the Custom Flashing easier and faster to install as well as better looking on the roof. Velux Pitched Skylights must be installed with a minimum pitch of 15°. Velux Recommends that Flat Roof Skylights have a minimum pitch of 3 - 5° so that water will not pool on the glass. 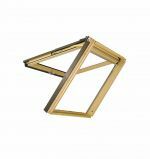 A great number of Australian roofs are pitched below 15° so Skyspan has developed the Pitch Adaptor Flashing to overcome low roof pitch preventing Velux Pitched Roof Skylights being utilized. The Skyspan Pitch Adaptor Flashing lifts the Skylight on the top side so that is pitched greater than 15°. Skyspan Custom Pitch Adaptor Flashings for Velux Pitched Roof Skylights and for Velux Flat Roof Skylights are available. Velux Standard Flashing is available in one colour only. If the roof the Velux is being installed on is not a dark grey colour the Standard Velux Flashing will not match the Roof Colour. 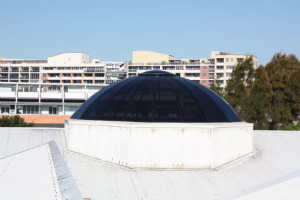 Skyspan Custom Velux Flashings are mill finish Zincalume as standard and can be powdercoated to match any Colorbond colour and thereby match the roof colour. 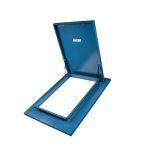 Skyspan Custom Flashings with the option of roof colour matching for Velux Pitched Roof Skylights are available and for Velux Flat Roof Skylights are also available. If you are located within an area of bush fire risk, you must comply with strict building codes for all building materials including windows and skylights. 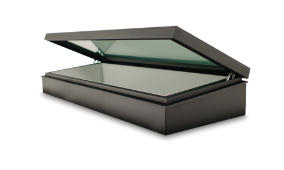 Most Velux Skylights have been tested and comply to BAL 40 requirements. When tested the Skylight used a custom flashing and thereby to comply with BAL 40, Velux Skylights must use a Custom Flashing. Australia uses many materials for Roofing, Skyspan Custom Velux Flashings are made standard in Zincalume and also have the option of materials such as Galvanised Steel, Stainless Steel, Ultra Steel, Aluminium and Copper. Velux Australia head office in Alexandria NSW has a many Velux Skylights and Roof Windows installed for Display purposes in their showroom. The roof is metal so they choose to use Skyspan Custom Flashings to install the Velux products to the roof. 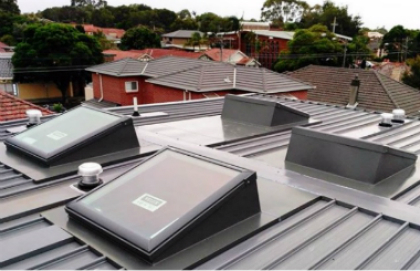 We recommend that you follow Velux Australia's lead and Trust Skyspan Custom Velux Flashings when installing Velux Products.